These gorgeous wedged sandals are the newest addition to the extensive Betsy women?s sandal range. They have a padded insole and a genuine leather lining making them extremely comfortable. 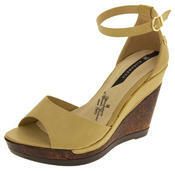 Lightweight unit with floral effect wedge heel and open toe to front and buckle fastening ankle strap.